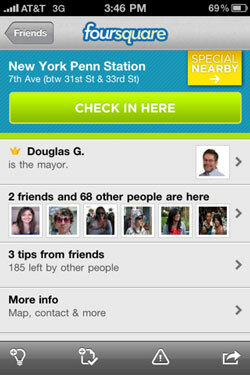 Foursquare is far and away the leader in the location-based social networking field. If you're not familiar with it, the premise is simple: install the app on your smartphone (it's available for all major platforms) and, while you're out and about, fire up the app to "check-in" from your favorite bar, restaurant or shop. You and your friends share your location with each other, which can be a little creepy, but you also earn points and badges. The game play elements are meant to encourage you to explore and visit new places. You also ear rewards for leaving "tips" for your friends. Does the place up the block have fantastic Pad Thai? Let your friends know in a tip. But even by Foursquare's own admission, the experience of checking in and earning badges hasn't expanded much. And its user base has primarily consisted teens and twenty-somethings always chasing the latest social networking trend. The new Foursquare 3.0 app for iOS and Android adds a slew of new features that are geared not just at offering more depth for those already using the service, but to lure average consumers into the fold. With version 3.0, Foursquare has launched "Explore," the company's first stab at personalized recommendations. It takes your own check-ins and tips, as well as those from your friends and other Foursquare users, and creates a list of recommended venues near you. So, if you're looking for a place to get great espresso nearby, or tasty vegan fare you can perform a quick search in the Explore tab. You can even search for specific terms like "romantic" or "bratwurst" to receive more fine tuned results. Another way to get recommendations is straight from your friends. Profile pages display not just check-ins, but a list of the types of places a person checks-in from most. The idea is to establish areas of "expertise", as Foursquare puts it. So, if you've got a friend who has hit every burger joint and karaoke bar in town, you'll know who to ask when you're suddenly in the mood for a medium-rare all-beef patty followed by three hours of belting out '80s pop hits. It's now becoming clear that the real rival of Foursquare is not Twitter or Facebook but services like Yelp. Perhaps most interesting with Facebook 3.0, though, are the new ways for businesses to offer deals and reward loyal customers. Foursquare has experimented before with offering discounts through partnerships with local merchants, but now that system is expanding in an attempt to stake out ground in the valuable (and quickly expanding) digital coupon market. But whereas sites like Groupon and LivingSocial grant you deals just for being in front of your computer, Foursquare requires you to leave your house to unlock the discounts. Still, it's hard to deny the appeal of simply taking out your phone to score 20-percent off an entrée at your favorite restaurant. 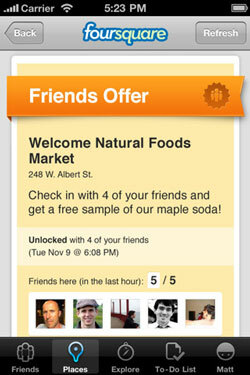 In total, Foursquare has created six different types of discounts that business can offer to patrons. Foursquare has partnered with a number of major retailers, including Barnes & Noble, Whole Foods, Applebee's, Radio Shack and H&M to help kick start the program. You can get the full list of launch partners here. Those who have been using Foursquare for some time will also notice that the "scoring" system and leaderboard are also updated. The new scoring mechanisms add more depth to the "gameplay" mechanics behind the check-in service. Points are now awarded for more abstract accomplishments like hanging out with friends or eating a new cuisine instead of simply for checking-in a lot. Earning points and badges isn't necessarily the reason to join Foursquare, but it does provide a sense of accomplishment for checking in while you wait to unlock your next coupon. 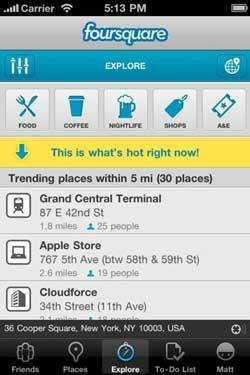 Foursquare 3.0 is available for Android, iOS and BlackBerry now. Symbian and Windows Phone 7 users will also get the update eventually but the company didn't have a firm estimate as to when that might happen.